Well, that has to be one of the most foul tasting chemicals I’ve ever had the inclination to inhale. It tastes kind of like I’d imagine chlorine would taste, if it were mixed with industrial strength grease remover, with a bit of cough-syrup thrown in as a sweetner. Every twelve hours I take a snort from this thing. I stick the tip into whichever nostril’s turn it is – I’m meant to alternate nostrils – while holding the other one closed with a finger to the side of the nose. Then I tip my head slightly back, then plunge down on ‘the shoulders’ of the little bottle above, so that it ejects a fine-mist like spray, while at the same time sniffing back. Apparently, the hormones are quickly absorbed into the blood stream through the thin skin lining at the back of the nose. While the foul-tasting gunk leftover slides down the throat, taking full advantage of every sensitive taste-bud it can reach while doing so. 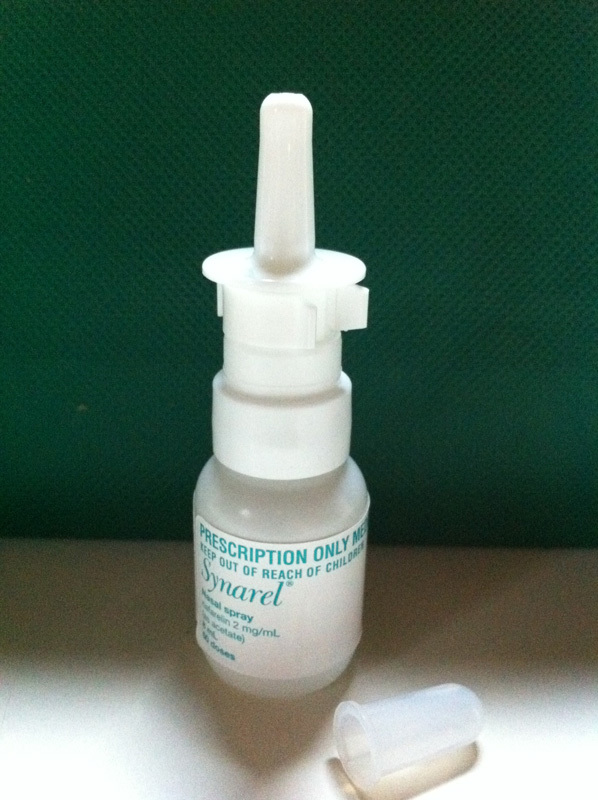 Now, apparently what this lovely nasal spray is doing is “down regulating” my body’s natural hormones. That is, along with its partner The Pill, which I’ve been on for about two weeks now, it temporarily decreases the oestrogen being produced by my body, so we can more effectively control the subsequent stimulation of the ovaries. Or some such thing. Basically we’re stopping my body doing anything at the moment, so we can then artificially make it do everything we want it to do. You know, grow lots of egg follicles with lots of mature and healthy eggs that will easily get me pregnant. The reality is, I sniff this stuff back twice daily, and keep taking the pill once daily, until next Thursday when I go for a blood test to see if it’s all working so far. If it is, I get to come off the pill and start on the Follicle Stimulating Hormones – the injections.